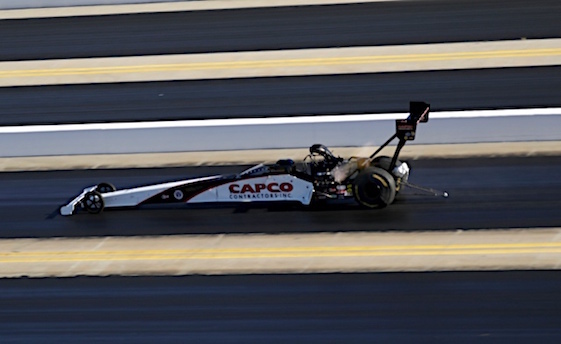 CONCORD, N.C. – NHRA Top Fuel drivers Steve Torrence and Clay Millican don’t have hundreds of employees, but Torrence hopes that the fact they’re the top two in the standings with their single-car operations will be inspirational to others. Torrence said the performance by his team and Millican’s was “big for the sport,” because it shows a person can do it on his or her own; that buying a ride isn’t the only option. Countdown to the Championship, winning the first three events in the six-race playoffs. At zMAX Dragway, Torrence was low E.T. through the first three qualifying rounds. He was relegated to second Saturday afternoon by defending Top Fuel champion Brittany Force in the final round of qualifying. Force posted an E.T. of 3.700 seconds, while Torrence’s was 3.704. Torrence maintained the distinction of top speed at 331.53 mph. Millican added two victories to his racing resume this year. The Drummonds, Tenn., resident was third fastest in qualifying. When Force bumped Torrence from the No. 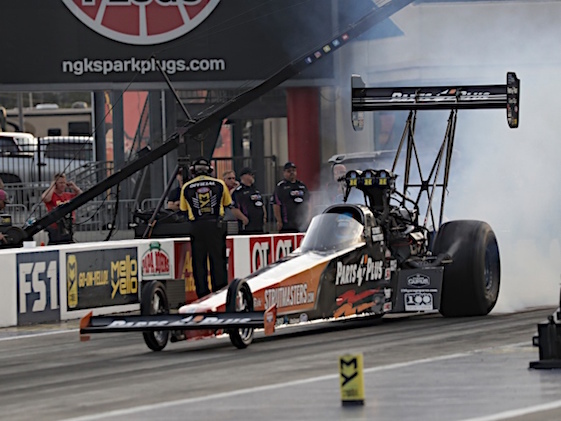 1 position, it put Torrence and Millican on the same side of Sunday’s elimination ladder. That means they could meet in the semifinal round. And that could be quite interesting since Torrence believes he and Millican have the same approach each week. Neither driver worries about the other, choosing instead to focus on their own team’s performance. “It’s crunch time,” Torrence said. “We need to just be consistent, maintain and execute. The good Lord knows the plan. It’s just for me and Clay to fight it out. I want to win, but if he wins, I’ll be really happy for him. Millican noted his team purchased a “starter kit” from Torrence so he could begin competing in the NHRA Top Fuel class. Millican is 5-foot-8 and weighs 145 pounds. Torrence weighs 150 pounds and is 5-foot-7. In the other classes Saturday, Funny Car driver Tommy Johnson Jr. claimed the No. 1 position in the final qualifying round with low E.T. of 3.873 seconds. Sixteen-time Funny Car champion John Force posted the top speed at 330.72 mph. Drew Skillman followed the same pattern in Pro Stock, taking the No. 1 position in the last qualifying round with a low E.T. of 6.509 seconds. Standings leader Tanner Gray recorded top speed at 212.33 mph. In Pro Stock Motorcycle, Eddie Krawiec moved into the No. 1 position in the second qualifying round and never relinquished it. His E.T. was 6.806 seconds. Hector Arana Jr. posted the top speed at 199.29 mph.